Music by the Mountain is a local non-profit 501(c)(3) organization committed to bringing extraordinary classical musicians to our community and providing educational outreach for children and students of all ages. Music by the Mountain is pleased to report that our 14th annual festival and fundraiser, a River Garden Symphony, was a huge success! On Saturday July 28th guests were treated to a relaxing evening along the Sacramento River at the Dunsmuir Botanical Gardens. Guests enjoyed wine while they wandered through the silent auction and visited with friends before savoring a dinner of gourmet hors d’oeuvres provided by Kevin Flynn Catering and dessert cookies provided by Betty Tennison. Performances by COS Instrumental Music instructor David Blink and this year’s Carol Medrano Memorial Scholarship winner Jason Holmquist provided wonderful entertainment during dinner and before our live auction featuring tickets to the San Francisco Opera, North State Symphony, and San Francisco Symphony. COS music professor Dr. Ron Slabbinck acted as our live auctioneer and held a fun and exciting auction full of high bidding for our fundraising efforts! The highlight of the evening was an outstanding performance by the Pacific Crest Music Festival Orchestra. Both our gala guests and concert attendees were treated to favorites such as Samuel Barber’s Adagio for Strings and JS Bach’s duet for violins, as well as pieces from Corelli and Mozart! MBM is honored to have been able to provide PCMF with a $1,000 scholarship to assist in their mission to provide a musical education to all students. For more information on the PMCF Orchestra and a list of this year’s student musicians please visit the artist’s page. 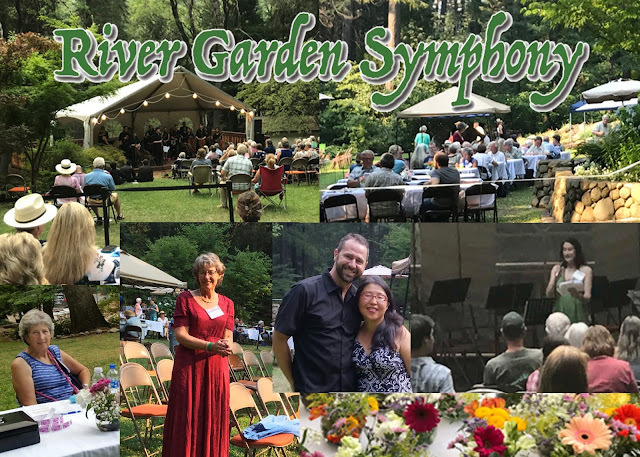 Finally, MBM would like to give a very special thank you to all those who volunteered and helped to make the River Garden Symphony a success and a truly wonderful evening! Please click this button to support Music by the Mountain's mission of bringing world-class live classical music performances and school outreach in Siskiyou County. Please click this button to donate to the Carol Medrano Memorial Scholarship Fund for Siskiyou County High School Graduates and College of the Siskiyous Music Majors. Copyright © 2014, All Rights Reserved, Music by the Mountain, PO Box 272, Mount Shasta, CA 96067 | . Watermark theme. Theme images by merrymoonmary. Powered by Blogger.